Kompozycja Przestrzenna / Spatial Composition, 2017　video, color, 5min.27sec. As the electric door of a garage opens and closes, various objects move around: a mattress hung from strings and wires, life preservers, a plastic shovel. Surrounded by concrete walls in the inorganic, homogeneous space of a garage interior, these three-dimensional readymade objects function like elements in an abstract painting. 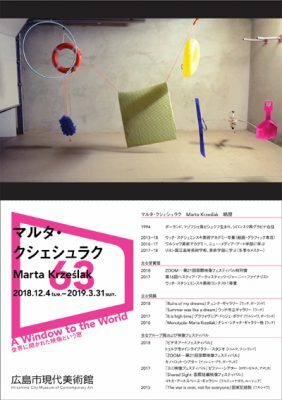 The artist, Marta Krześlak, says of this work, “I detach the objects I find inside from their usual function, which makes them stand out in the everyday reality remembered by the recipient. The piece is also an observation of how particular forms influence each other, creating abstract images at the same time.” Like symbols appearing in dreams, these objects seem to be stripped of their original meanings and invested with entirely new ones.